Ansible testing is something I think we're going to start seeing more of in the future. Tonight I took to testing it with inspec. Inspec is an infrastructure testing tool from Chef. Inspec is created in the style of Serverspec and even throws a shoutout to that software and to mizzy specifically in the readme. There are a bunch of other tools in this space: testinfra is written in python, beaker to some extent fills this role, and goss is a go version, nicely covered by Dean Wilson. At a high level, I feel strongly that these tools can be used to make systems operations code better. However, I think it is easy to fall into writing your code twice, once in Puppet and once in serverspec. Our limited use of Beaker at work started strong and has atrophied, mostly from frustration with this duplication and a shared sense that it wasn't providing value. I also worry that we will end up coding to the bugs in implementations. Puppet's core types have remained untouched for years, and their behavior at this time is essentially an API contract. Each of these tools has specific implementations that have bugs and decisions baked in, and we'll be stuck with them until someone boldy breaks compatibility or we simply move to the next tool. I was drawn to Inspec by Stuart Preston's presentation at Config Mgmt Camp 2016. What drew me in further was the use of inspec on a remote host without software installed on it. This 'agentless' mode neatly pairs with the Ansible methods, so using them together seemed reasonable. This presentation on inspec is also exceptional from Dominik Richter. From this we can perform a list hosts and a ping. This playbook does very little, installing only the apache2 package. title "Test some simple resources"
This reads like any block of Puppet, Ansible, or other systems tooling that has been around, with a sprinkling of rspec or rspec-puppet. There is a long list of available resources in the inspec documentation. Inspec easily installs with gem. Inspec can detect the remote machine and give you its operatingsystem version. I don't really see the direct value in this, but it is a nice ping/pong subcommand to test the connection. Inspec right now does not have the ability to ask my ssh-agent for permission to use my key, I have a less-secure key (though by no means totally insecure) key that I use in instances like this. The -t connection infromation flag has a fairly straightforward syntax. Like any agentless tool inspec supports a number of flags allowing it to connect as an unprivileged user and to use sudo to achieve root permissions. We can now run our test (before our ansible playbook has run, to validate that we are getting failures). Seeing partial tracebacks is not great, but the output is easy enough to understand. We had three things we were asserting and none of them are true. The colors are lost here, but the 'ok' output is green and the 'changed' output is yellow. We can reasonably expect that the apache package was installed and that the service is running. I am usually tempted at this point to run the playbook again to verify idempotence but for such a simple playbook that isn't necessary. A much prettier output, to be sure. With this we have two tools, one to make changes and the other to verify state. Unfortunately there is a lot of code duplication. We could probably write a simple tool to parse ansible and dump inspec code, but I feel like that would ultimately only be a tool that would reveal implementation differences between the two tools. I could not get this check to pass. Eventually I dug into the code and discovered that its('processes') returns an array of strings, each string containing a process name. In unix, only one process can hold a port like that, so this is a bit of an odd choice for a return type. I had expected a single string to be returned and for 'include' to do a substring match on 'apache'. Not the least important result of this brief debugging was that inspec resources are very small and readable. Using these tools together means having both ruby and python set up. This isn't a problem for me, because both of those are already in my development and testing environments. For others, using a single runtime would be more valuable than picking up a new tool. There are a lot of tools in this space, and all seem passable. This kind of testing still requires a unix node of some type. Both ansible and inspec can test using docker, but I have come to prefer testing my infrastructure code on virtual machines. Part of this is that I have almost always had a ready supply of virtual machines to use for this testing. Inspec is flexible. It has docker, virtual machine, and local functionality. It even has windows support. Inspec has a long list of native resources, enabling you to test high level features like 'postgres_config.' Because an inspec resource is only a status check, it is infinitely easier to write, debug and reason about. The tone at ConfigMgmtCamp 2016 was that inspec is the future and will be replacing serverspec in most uses. I am interested to see what can be done with testing inspec in CI pipelines. The simple three command pattern of this blog could easily be encoded to a CI pipeline, if the CI system has sufficient resources. Inspec has a local application mode that could be used with puppet apply. I am interested to see if and when beaker integration will be attempted, as most of my infrastructure testing uses beaker at the moment. Thanks to Bastelfreak and Bkero for editing this post prior to publication. This week I attended FOSSETCON in Orlando, Florida. I had the opportunity to meet a number of free/open source software leaders, and they took the opportunity to make me feel very included. Overall I had a great time. I was able to present twice at this conference, due to a comedy of errors around scheduling. I enjoyed giving both talks immensely and I will be talking again on these subjects I am sure. On Friday I spoke on Tinc and Consul, a private mesh networking tool which we then overlaid with service discovery. Using these together is a pet project some personal friends and I have been working on for some time. I was able to focus mostly on the tinc components of our infrastructure. After the talk, I was mobbed by people wanting to use tinc to flatten a network somewhere in their infrastructure. I admit I had not even considered that application! Amusingly my talk made the "news" section of the tinc website. I want to especially thank Ben Kero for stepping up to give this talk and for writing the first draft of the slides. I did a live demo of tinc providing security for NFS, then played fullscreen video over NFS over the internet on conference wifi! I had an Awesome Audience! On Saturday I spoke on OpenStack. This was a talk I inherited from Monty Taylor, who couldn't be there due to a scheduling conflict. I spoke on how OpenStack is a functioning platform and that the success of Infra project is evidence of that. I then talked about the rougher spots in OpenStack right now, particularly in abstractions that leak deployment details. I then introduced the OpenStack Client-Config and Shade efforts as a way to ameliorate that. Of the talks I saw at FOSSETCON two stand out to me. The first was the introduction and demo of Oh My Vagrant by James (just James). In this talk, James took us through Vagrant (sneakily running through libvirt instead of virtualbox) into docker and then all the way to kubernetes. James did lose some people along this lightning ride but for those of us that kept up it was quite enjoyable and informative. The second talk I enjoyed was Marina Zhurakhinskaya's talk on diversity at the closing keynote. She had some concrete advice and I took a couple key items away from her talk that I will be applying to the communities I have influence in. The most surprising tip to me (but not really once you think about it) was the need for there to be a room for new mothers at conferences. If we require (by law) for companies to provide this resource, it makes sense to make an effort to provide it at a conference with hundreds of attendees. The slides from Marina's talk can be found here. Overall FOSSETCON was a great conf. I met so many new people, and I connected with people like Deb Nicholson that I had met before but never gotten to know well. I would definitely compare it to SeaGL on the west coast. It has the same low-budget, high-community, minimal-coporate feel that makes it ok to talk about free software without a direct application to business needs. At the conf I got turned on to SELF which I plan to apply to soon. I strongly recommend you attend FOSSETCON 2016 if you are in the central Florida area next November. The Puppetlabs Apt module went through a major change earlier this year. It crossed a semver boundary and released as 2.0. This is one of the only cases we've had as a community where a core module has moved over a major version. The initial reaction to Apt 2.0 was everyone quickly pinning their modules to use < 2.0. Morgan, Daenney and the puppetlabs modules team quickly pushed out a 2.1.0 release which is backwards compatible with some core functionality inside the Apt module. It is important to note that not everything is backwards compatible, only a few things. At OpenStack-Infra, we wanted to use the latest version of bfraser's graphana module but it requires apt >= 2.0. Paul spun up a change to our main repository and then several more changes to move to the new syntax. Here is an example. Why does this work? Because apt::key was added back in 2.1.0 to be compatible with older apt versions. See the warning that it will generate here. Because of this, you can upgrade apt in place safely, provided you are not use the gnarlier parts of the old Apt module. Notably the unattended-upgrades subsection has been moved out into its own module. I encourage those of you running an infrastructure to follow our lead and upgrade your Apt module. I encourage those of you maintaining and releasing modules to bump your minimum version of Apt to => 2.1. I believe there is a requirement for some velocity in this. If we wait too long, too many new users of Puppet will be caught across a schism of the apt module. That is, unless everyone just runs RedHat anyways. Just What Is OpenStack Infra? I work for HP doing two things. By day I work inside the HP firewall setting up and running a CI system for testing HP's OpenStack technology. We call this system Gozer. (By the way we are hiring). By night I work upstream (in the Open Source world) with the OpenStack Infrastructure Team setting up and running a CI system for OpenStack developers. This blog post concerns my work upstream. One mark of the success of this ongoing initiative is that I am now in a place where I am recommending parts of our code to other people in my community. Those are the people for whom I intend this blog post. Someone sees a neat part of the Puppet OpenStack 'stuff' and wants to use it, but it needs a patch or a use case covered. This blog post is supposed to provide a high level overview of what we do, who 'we' are, and the bigger pieces and how they interact with each other. We'll start with a long series of names and definitions. So what is OpenStack? OpenStack is an Open Source software collection based around providing cloud software. The OpenStack Foundation is a nonprofit organization that provides centralized resources to support the effort, this comes in both technical (sysadmins) and other forms (legal, conference organizing, etc). OpenStack is made up of many components, the simplest is that 'nova' provides a compute layer to the cloud i.e. kvm or xen management. I do not work with these modules on a daily basis. 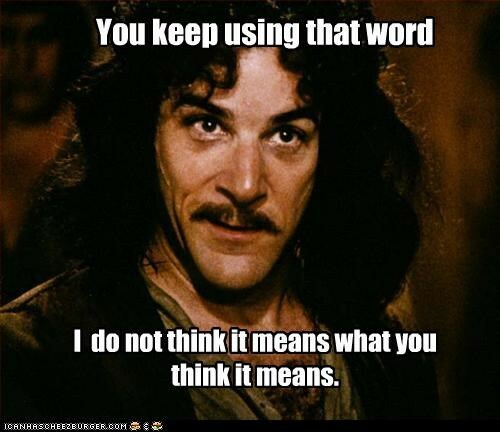 I work with the OpenStack Infrastructure Team. This team deploys and maintains the CI system used by OpenStack upstream developers. We have our own set of Puppet modules that are completely unrelated to the OpenStack Puppet Modules. Their source code can be found by searching for openstack-infra/puppet-*. These modules are uploaded under the forge namespaces 'openstackci' and 'openstackinfra.' We use these modules to deploy services like Gerrit, Jenkins, and Drupal. We also have a number of utility modules useful for generic Linux administration. We have Precise, Trusty, Centos 6, and various Fedora flavors in our infrastructure, so our modules often have good cross-platform support. All the openstack-infra/puppet-* modules are consumed from master by our 'central nexus' repository: system-config. System-config uses a second repository for flat-files: project-config. System-config contains node definitions, public hiera data(soon), a few utility scripts, a modules.env file, a single module to stick 'roles' in called 'openstack_project'. The more 'core' roles in openstack_project call out to another repo called: puppet-openstackci. The secrets are stored in a hiera directory that is not public. The crude drawing above shows a typical flow. A node definition lives in site.pp, which include a role class from openstack_project, which includes a role class from the openstackci module, which then uses resources and classes from the other modules, in this case puppet-iptables. There are other code paths too. Sometimes, often in fact, an openstack_project role will include openstack_project::server or openstack_project::template, these classes wrap up most of the 'basics' of linux administration. Template or server will go on to include more resources. There are multiple places to integrate here. At the most basic, a Puppet user could include our puppet-iptables module in their modulepath and start using it. An individual who wants a jenkins server or another server like ours could use openstackci and it's dependencies and write their own openstack_project wrapper classes to include openstackci classes. We do not encourage site.pp or openstack_project classes to be extended at this time, we instead encourage features or compatibility extensions to be put into openstackci or the service-specific modules themselves. This is a work in progress and some important logic still lives in openstack_project and should be moved out. A stretch-goal is to move to a place where all of openstack infra runs out of openstackci, providing only a hiera yaml file to set parameters. 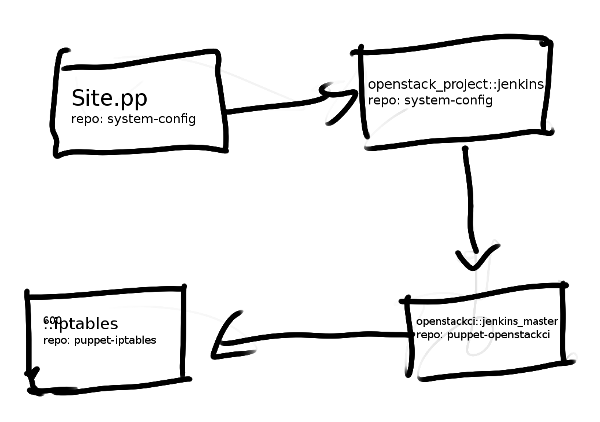 A note about modules.env: OpenStack-infra has a modules.env file instead of a Puppetfile. This file contains the location, name, and ref of git repositories to put inside the modulepath on the Puppetmaster. OpenStack infra deploys all of its own Puppet modules from master, so any change to any module can break the whole system. We counteract this danger by having lots of testing and code review before any change goes through. A note about project-config: One of the patterns we use in OpenStack Infra is to push our configuration into flat files as much as possible. We have one repository, project-config, which holds files that control the behaviour of our services, Puppet's job is only to copy files out of the repo and into the correct location. This makes it easier for people to find these often-changed files, and means we can provide more people access to merge code there than we would with our system-config repository. A note about puppet agent: We run puppet-agent, but it is fired from the Puppetmaster by an ansible run. We hope to move to puppet apply triggered by ansible soon. # we need the more specific one first. This enables you to manage iptables the way you view iptables. It is easy to debug, easy to reason about, and extensible. We think it provides a significant advantage over the puppetlabs-firewall module. Unfortunately, the puppet-iptables module currently is hardcoded to open up certain openstack hosts, that should be fixed very soon (possibly by you!). Both of these modules try to be as simple as possible. Getting these modules right now is done through git. If you don't want to ride the 'master' train with us, you can hop in #openstack-infra on freenode and ask for a tag to be created at the revision you need. We're working on getting forge publishing in to the pipeline, it's not a priority for us right now but if you need it you can ask for it and we can see about increasing focus there. There are two generic modules that advance the puppet ecosystem coming out of OpenStack Infra and we hope there will be more to come. If you'd like to help us develop these modules we'd love the help. You can start learning how to contribute to OpenStack here. Last week at #puppethack, @hunner helped me land a patch to stdlib to add a load_module_metadata function. This function came out of several Puppet module triage sessions and a patch from @raphink inspired by a conversation with @hirojin. The load_module_metadata function is available in master of puppetlabs-stdlib, hopefully it will be wrapped up into one of the later 4.x releases, but will almost certainly make it into 5.x. This is an example of Puppet code that can inspect the libraries loaded in the modulepath, then make intelligent decisions about how to use them. This means that module authors can support multiple versions of 'library' modules and not force their users into one or the other. This is a real problem in Puppet right now. For every 'core' module there are multiple implementations, with the same name. Apache, nginx, mysql, archive, wget, the list goes on. Part of this is a failure of the community to band behind a single module, but we can't waste time finger pointing now. The cat is out of the bag and we have to deal with it. We've had metadata.json and dependencies for a while now. However, due to the imperfectness of the puppet module tool, most advanced users do not depend on dependency resolution from metadata.json. At my work we simply clone every module we need from git, users of r10k do much the same. As we already saw, modules can express dependencies on specific implementations and versions. They can also inspect the version available and use that. This is extremely useful when building a module that depends on another module, and that module is crossing a symver major version boundary. In the past, in the OpenStack modules, we passed a parameter called 'mysql_module_version' to each class which allowed that class to use the correct invocation of the mysql module. Now classes anywhere in your puppet code base can inspect the mysql module directly and determine which invocation syntax to use. Modules can even open up their own metadata.json, and while it is clunky, it is possible to dynamically assert that dependencies are available and in the correct versions. I'm excited to see what other tricks people can do with this. I'm anticipating it will make collaboration easier, upgrades easier, and make Puppet runs even more safe. If you come up with a neat trick, please share it with the community and ping me on twitter(@nibalizer) or IRC: nibalizer. In OpenStack, we use gerrit and git-review to propose changes to the repository. The workflow for that is pretty complicated, and downright confusing if you are coming from the github workflow. One of the places where it gets hard/complicated/annoying to use our workflow is if you have multiple dependent changes. I have a technique I use, that I will present below. The situation: You have two patches in a stack. There is a bug in the first patchset that you need to fix. The simple play: Checkout the patchset with 'git review -d <review number>', ammend and git-review. The problem with this is that now you need to go rebase all dependent patchsets against this new review. Sometimes you can get away with using the 'rebase' button but sometimes you cannot. What I do: I use 'git rebase -i HEAD~2' and use 'edit' to change the commit that needs to be changed, rebase goes ahead and auto-rebases everything above it (pausing if needed for me to fix things), then I can 'git review' and it will update all the patchsets that need to be changed. This approach works for any sized stack, but using it on a two-stack is the simplest example that works. Managing exim is the one thing sever can do that template cannot. This is part of a multi stage process for merging server and template. 14 # These lines can be re-ordered; they are executed from top to bottom. 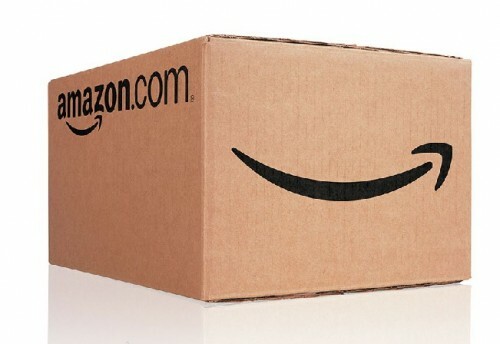 16 # If you remove a line here THAT COMMIT WILL BE LOST. 18 # However, if you remove everything, the rebase will be aborted. You are currently editing a commit while rebasing branch 'master' on 'af02d02'. Do you really want to submit the above commits? With that we have changed a commit deep in the stack, rebased any commits above it, and published our changes to the gerrit server. Last week I gave this presentation at the PDX Puppet Users group. 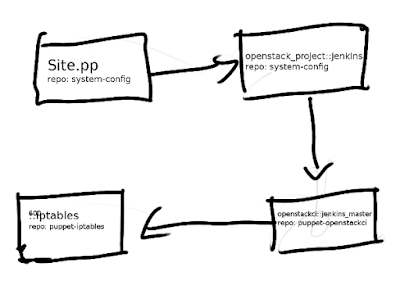 It is an overview of how we use Puppet in the OpenStack Infra project. There is no video or audio recording.